When our son Nicholas was 2 years old, we drove from Pennsylvania to Oklahoma, stayed a while, and drove back. In each direction, we spent 3 days in a row on the road for about 8 hours a day of actual driving time, plus rest stops. My cousin who has older children gave me two very helpful tips, and I thought of another idea that proved even more useful than those! Tip #1: Bring a Magna-Doodle or similar self-contained drawing toy, instead of crayons/markers and paper. It’s much less messy! Tip #3: Before your trip, visit the public library and check out enough picture books to fill a tote bag. If you’ll be on the road multiple days in a row, fill two bags. Hide the books until you’re packing the car. (Ideally, go to the library alone so your child doesn’t even know you have these books.) Put the book bag in the back seat so that one parent or older sibling can sit there and read to the little one. Bringing lots of new-to-you books makes this much more interesting than if you just bring a few familiar books. For a multi-day trip, put one bag in the trunk, and then swap them for the second day of travel. Of course, this tip only works if your family includes at least one person who is able to read in a moving car and doesn’t have to be driving all the time! If you’re a parent traveling solo with a young child, check out audio-books instead. 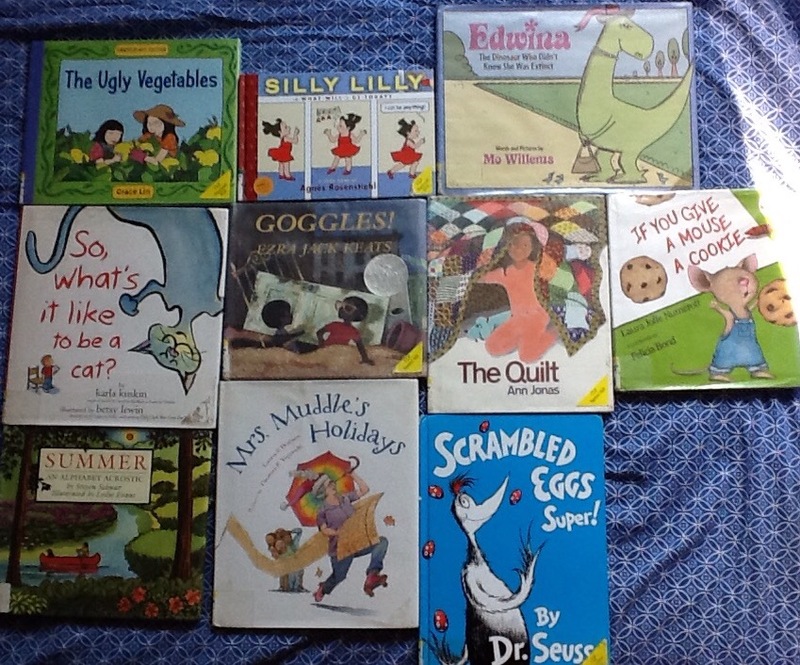 Many novels written for early-elementary children are interesting to preschoolers. On a road trip when Nicholas was 4, we enjoyed Ramona and Her Mother by Beverly Cleary and Superfudge by Judy Blume. Our daughter Lydia is 2 now, and we recently drove from Pittsburgh to Baltimore, which is about 5 hours each way. I kept Lydia entertained with the books shown here. I really managed to pick a bag of winners this time–there was only one book she didn’t really like. The Ugly Vegetables by Grace Lin. A girl learns why her mother grows Chinese vegetables instead of a pretty flower garden. Silly Lilly in “What Will I Be Today?” by Agnes Rosenstiehl. Lilly experiments with a different career option every day of the week, in comic-strip format. Edwina, the Dinosaur Who Didn’t Know She Was Extinct by Mo Willems. A logical young boy is angry that everyone in town accepts Edwina, so he sets out to prove she can’t exist. So, What’s It Like to Be a Cat? by Karla Kuskin, illustrated by Betsy Lewin. A boy interviews a cat about the feline experience, in rhyme. Goggles! by Ezra Jack Keats. Peter and Archie find something cool in the vacant lot–but a menacing group of big boys try to take it from them. The Quilt by Ann Jonas. A girl and her favorite stuffed dog have an adventure in the world created by a patchwork quilt and a half-conscious mind. I think this was Lydia’s favorite! If You Give a Mouse a Cookie… by Laura Joffe Numeroff, illustrated by Felicia Bond. A boy shares his snack with a cute visitor and has his hospitality stretched by a series of cascading requests. Summer: An Alphabet Acrostic by Steven Schnur, illustrated by Leslie Evans. Summery words starting with the letters A to Z are each turned into an acrostic poem, in which each line begins with a letter of the word. This is the book Lydia didn’t care for–it’s more interesting to people who can read. I liked the illustrations, but she didn’t. Mrs. Muddle’s Holidays by Laura F. Nielsen, illustrated by Thomas F. Yezerski. A lively lady moves into the neighborhood and teaches everyone the joy of celebrating occasions they’ve never heard of before. Scrambled Eggs Super! by Dr. Seuss. Young Peter T. Hooper sets out to make special-deluxe scrambled eggs by raiding the nests of very exotic birds. These road-trip tips work for me! For more picture-book recommendations, check out my book reviews after last year’s Thanksgiving trip! Visit Literacy Musing Monday for more book-related writing. Thanks for joining us at the #LMMLinkup.